As usual, three hip hoorays to Mr. UFO, Timothy Green Beckley, who steps up to plate big time by reprinting Ray Palmer's The Hidden World... making Figbar's complete collection of original HW volumes nearly worthless for Ebay! But not bitter, no. Unlike originals, though - Mr. UFO, always Mr. Entrepreneur, adds things to lure potential reader to buy his reprints. For one thing, he asked different well-known Shaver Mystery writers (like himself) to write introduction to each volume. Mr. UFO pretty smart guy - he wait until volume 5 before he allows Shavertron editor to write one. But Mr. UFO taking long walk on short pier by doing that. Could wipe out any interest in volumes 6 through 16. Yes, that is how many volumes there are to come! Also changed for these reprints are the size of volumes. Mr. UFO's reprints are larger, like 11x8.5 size. Also changed are covers. Totally redesigned very colorful covers. "What is the Shaver Mystery? Here Is A Mystery That Stretches From The Madhouse To The White House; From the Moronic To The World's Greatest Minds; From the Superstition To Scientific Knowledge; From The Forgotten Past To The Present Instant!" Who in heck writing ad copy for Mr. UFO anyway? Rod Serling? If so, forgot this part: "... From pit of Man's fears, to summit of his knowledge. There is signpost up ahead, it's The Shaver Mystery." Only other guy who write hype of this magnitude was Great One himself - Ray Palmer! 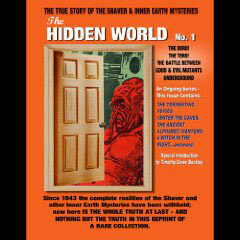 So buy Hidden World reprints and support Mr. UFO, who is only publisher who will dare print such things nowadays. Do like Figbar and get full set for Shaver Mystery library, but not on Ebay. Two thumbs up for Mr. UFO!